It was with deep dismay that we bid farewell to Le Sausage van and its saucy '50s mascots last year, but Jakob's Kitchen takes up right where that snag-wagon left off. Right down to its fire engine red paint job. Jakob's schtick is European sausages. 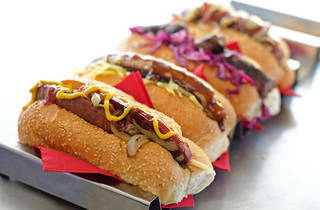 The beef and pork skinless Chevapi come with shredded sweet cabbage, barbecued onion and sauce in a crunchy baguette, while a fat kransky gets a smack of lurid American mustard, squiggles of sauce and plenty of cheese. 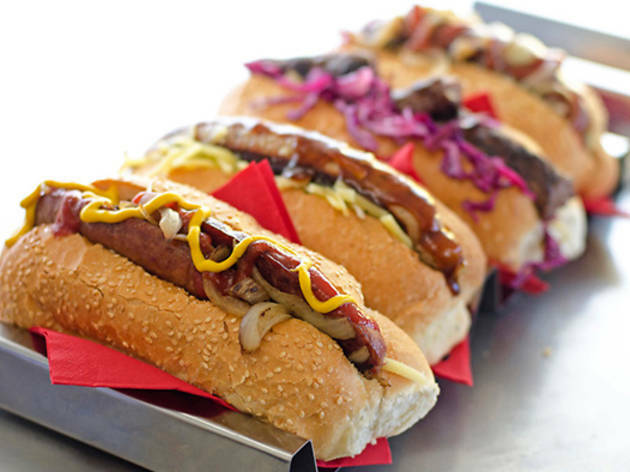 Barkly Square has become a regular hang out of late, but the sausages go wherever the party is. Hit the Twit' or check our truck finder to keep track.